Luas Cross City will start carrying passengers in December. Luas Cross City will have more test runs over the summer. THERE WILL BE major traffic disruptions for a week in Dublin city because of “the final significant piece of road construction” for the new Luas Cross City. The traffic flow changes will take place in the heart of the city at the north and south quays at the junction with O’Connell Bridge from the end of next week. The works come as further tram testing is to be carried out ahead of the new service starting to take passengers in December. Luas drivers will also receive fresh training ahead of the opening of the new line. The roadworks will lead to the full closure of the junction with O’Connell Bridge at Burgh Quay and Aston Quay beginning from 8pm on Friday 4 August and will continue until 6am on Saturday 12 August. It means there will be no through-route past O’Connell Bridge on the south Quays and no right turn onto the bridge. Instead, motorists will be directed down D’Olier Street and the bus-only corridor that exists on Dame Street will be opened up to all traffic for the duration of the works. Traffic will be able to travel north from Westmoreland Street onto O’Connell Bridge but will not be able to turn left at the junction. After this we’ll still be doing footpaths and paving and curbing, but in terms of big set pieces like this there won’t be any. This is a significant closure and diversion. It’s on the quays, which are really busy, so you won’t be seeing anything else like this between now and the completion of the project. In addition to on-street works that are being carried out to prepare for the introduction of the new Luas line, behind-the-scenes efforts also being made to ensure that the trams run smoothly once the service begins. Luas operator Transdev earlier this year began a recruitment drive to increase driver numbers ahead of the introduction of the new line, which links the existing two lines. Both new and seasoned Luas drivers have been using simulators that mimic the new route but formal driver training is to commence in September. 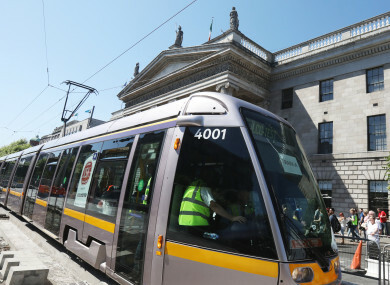 “It’s a whole different part of the city that they’ll be driving – the junctions, the interactions with other traffic, the route alignments, the stops, as well as where the platforms are and that kind of stuff,” said Luas Cross City spokesperson Gráinne Mackin. Some access will be given to the Aston Quay area during the works for local and delivery vehicles to reduce the disruption for local businesses. Email “There are some major Luas traffic disruptions coming (but they'll be the final ones before it starts running)”. Feedback on “There are some major Luas traffic disruptions coming (but they'll be the final ones before it starts running)”.